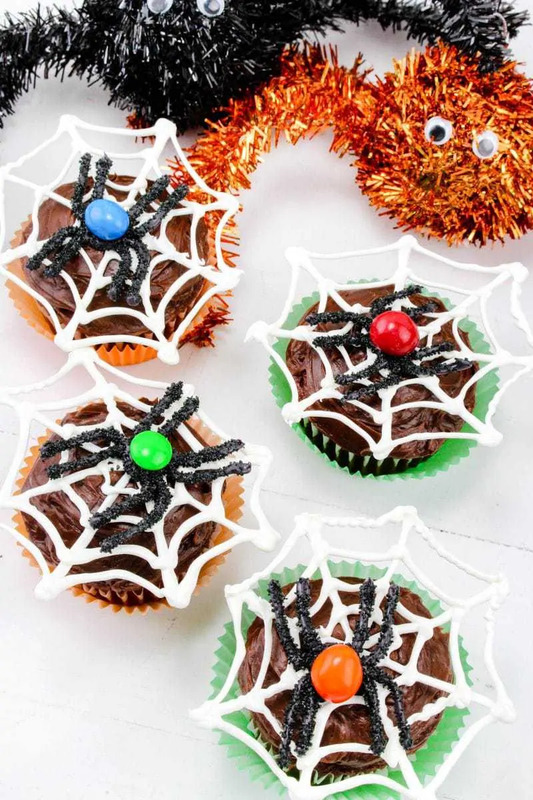 Make these fun Halloween spider web cupcakes with chocolate spiders this year for Halloween! Just follow this easy recipe tutorial. We consider Halloween to be the big kick off to the holiday season – also known as baking season in our house. I love spending time in the kitchen this time of year. Baking up delicious Halloween desserts a a family is not only fun, but it can create wonderful memories as well. Not only are these spider cupcakes easy to make (you can start with cupcakes baked from scratch or from a mix), but they are also lots of fun to decorate. Looking for other spider-themed treats? 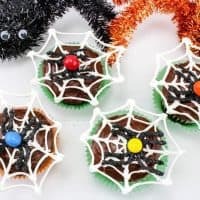 Check out these easy spider brownie bites. If you want to encourage creativity in your children, having the kids help decorate these cupcakes would be a perfect activity. There are so many ways that you could switch up this recipe. You could simply set up a variety of candies to give them more options to choose from. That way they can choose the candies they want to use to decorate their cupcake to make it their own. Who says a spider can’t be hot pink or lime green? 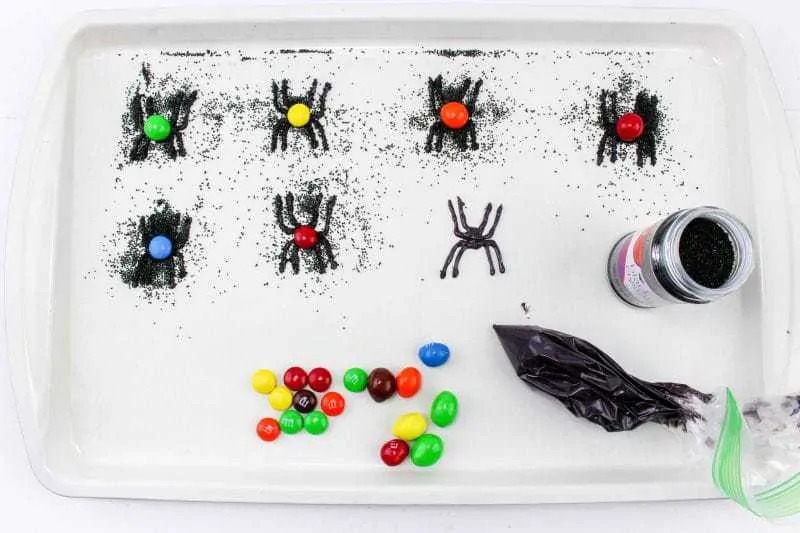 You could also switch it up by using different colors of candy melts to make the spider webs. 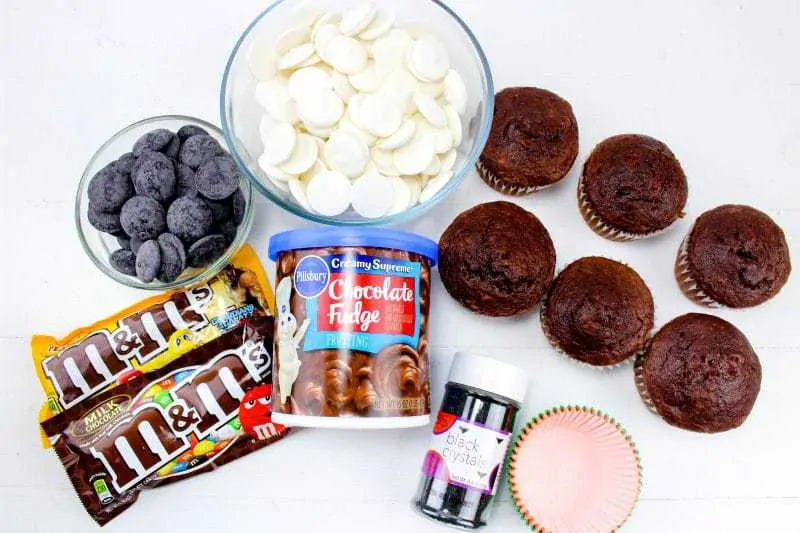 Or, play around with the flavors of the cupcakes themselves and the frosting. Choose gourmet flavors or something simple. For example, pair vanilla frosting with strawberry cake and then use pink chocolate melts to make a super girly spider web cupcake. Basically, feel free to think of the recipe below simply as a guideline to create your own spider cupcakes that are truly unique. 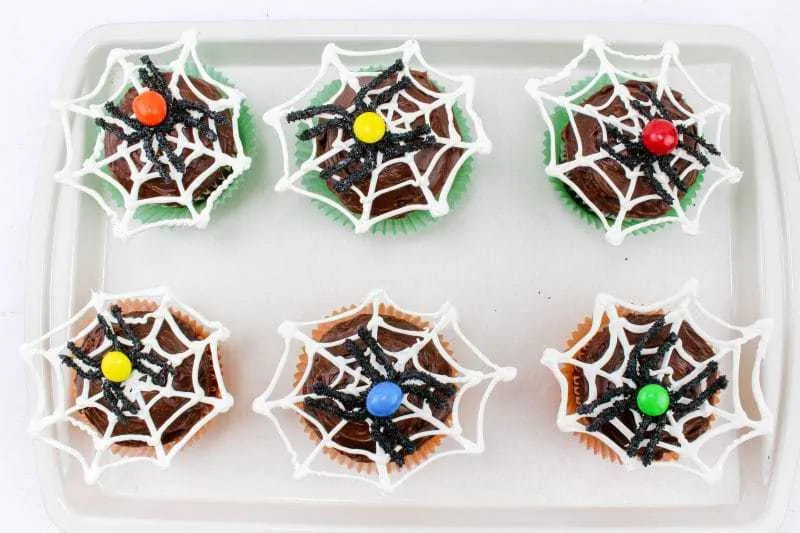 These spiderweb cupcakes are the perfect baked treat for Halloween school parties, spooky at-home parties, or even for Halloween bake sales. But no worries if you don’t have any kids. Adults will totally get a kick out of these creepy Halloween cupcakes as well. 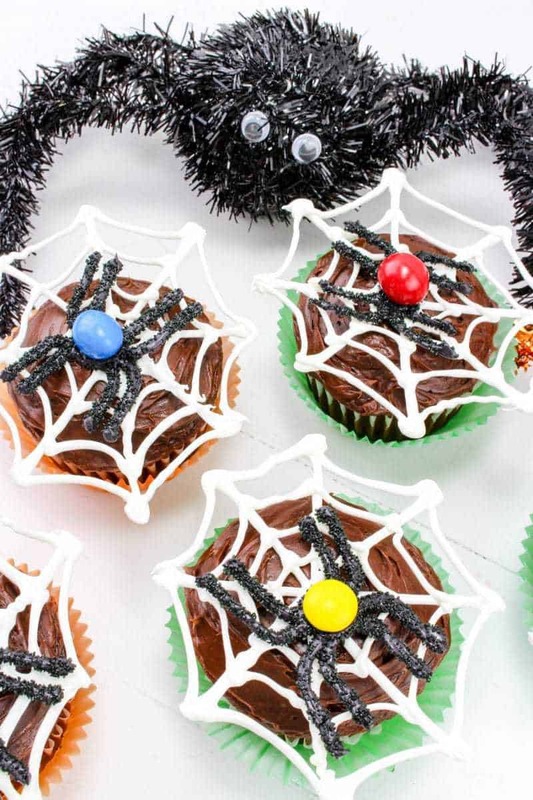 First, let’s take a look at what you will need to make these spiderweb cupcakes. Next, I will go through the process with you step by step. And finally, you will find a printable version of the recipe at the bottom of the post included for your convenience. 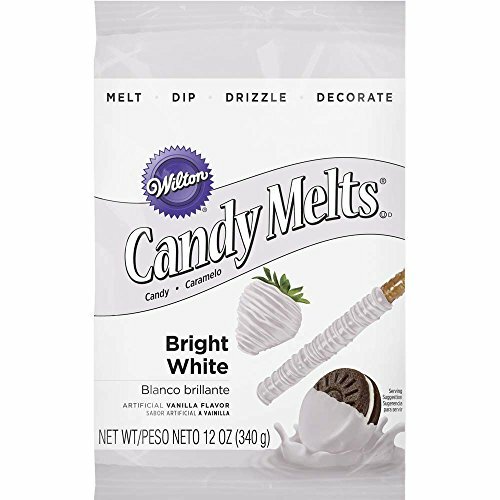 Melt white candy melts per package directions and put in a small plastic bag for piping. 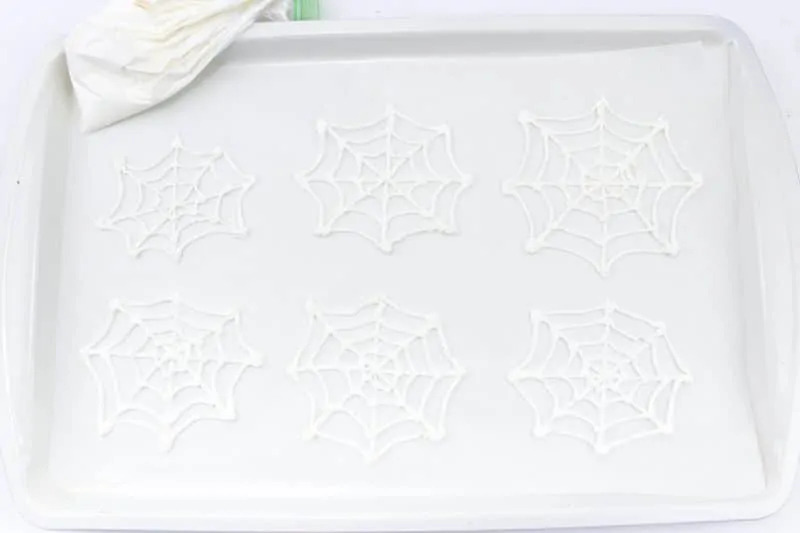 Pipe spider webs onto a parchment lined baking sheet. Make the webs a bit larger than the cupcake tops. Allow to dry. Melt the black candy melts per package directions and put in a small plastic bag for piping. On a parchment lined baking sheet, pipe small spiders. I started with a dime sized dot of chocolate, and then added 4 legs on each side. Sprinkle the black sugar over the spiders and place a chocolate candy in the center. Allow to dry. Once spider and web are completely set, peel them off the paper. 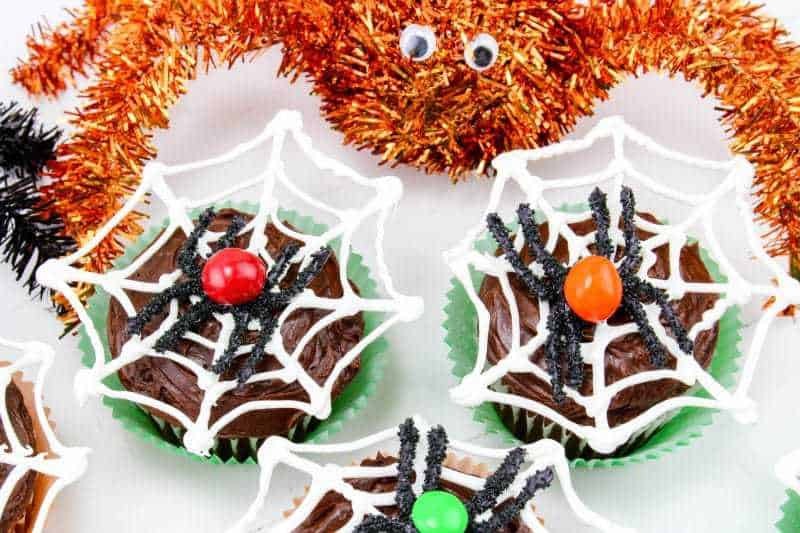 Place a spider web on each cupcake, and set a spider on top of each web. I hope that you enjoy this fun and delicious Halloween treat. If you are looking for more spooky Halloween desserts check out our Frankenstein Jolly Rancher Suckers, Mummy Rice Krispie Treats, Bloodshot Monster Eyeball Doughnuts, and Ghost Doughnuts. 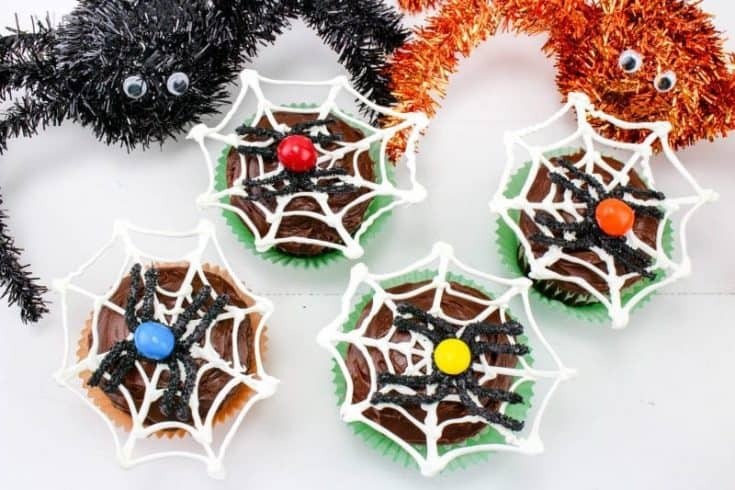 Make these fun Halloween spiderweb cupcakes with chocolate spiders this year for Halloween! Just follow this easy recipe tutorial. 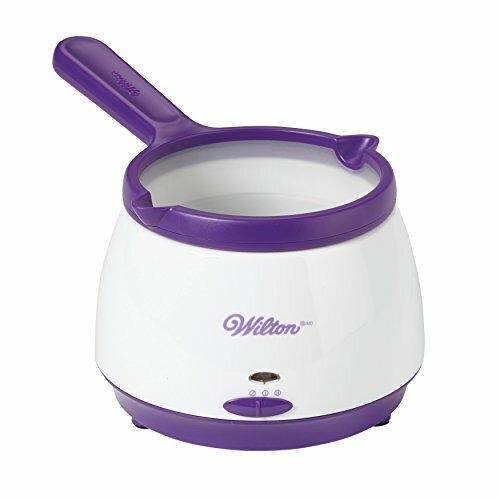 Melt white candy melts per package directions and put in a small plastic bag for piping. Pipe spider webs onto a parchment lined baking sheet. Make the webs a bit larger than the cupcake tops. Allow to dry. 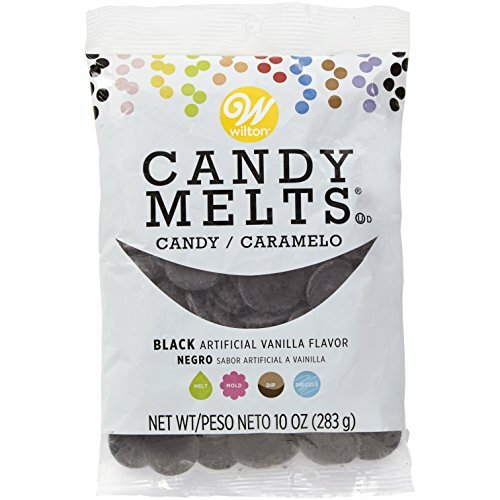 Melt black candy melts per package directions and put in a small plastic bag for piping. On a parchment lined baking sheet, pipe small spiders. I started with a dime sized dot of chocolate, and then added 4 legs on each side. 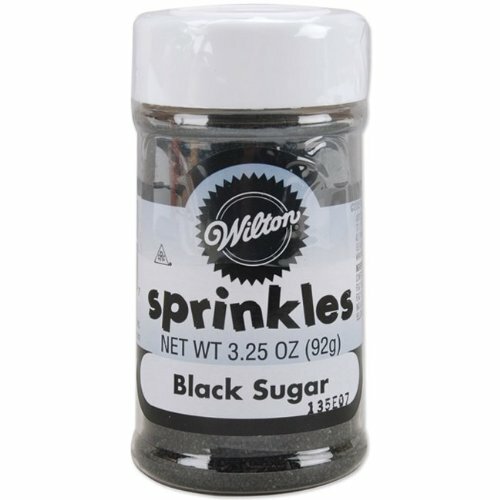 Sprinkle black sugar over the spiders and place a chocolate candy in the center. Allow to dry. Those look terrific! That’s very creative that you formed the webs before the chocolate dried, at first glance I wasn’t sure how you got them so solid. These are so cute, and I think I could do this with my daughter following your instructions! Thanks for making it look easy! What a spooky yet scrumptious idea! These cupcakes are totally perfect for Halloween. I love that you added sugar to the spider legs for texture too. So usually I look at tutorials and am like – urm 50 ingredients there’s no way I could pull that off but this looks super easy and they’re really fun to make. We’re going to be checking out Charlotte’s Webb for homeschool soon and these would make a perfect snack for us to create together! Love these! I want to give them a try. I know my kids would absolutely love them. They look easy yet adorable at the same time. You are incredibly talented! Those tiny little spider webs with spiders on them are amazing! OH these are so fun! My son just got the shivers looking at them, lol. These are so cute! I love the idea. Thanks for the recipe/instructions. These look amazing!! 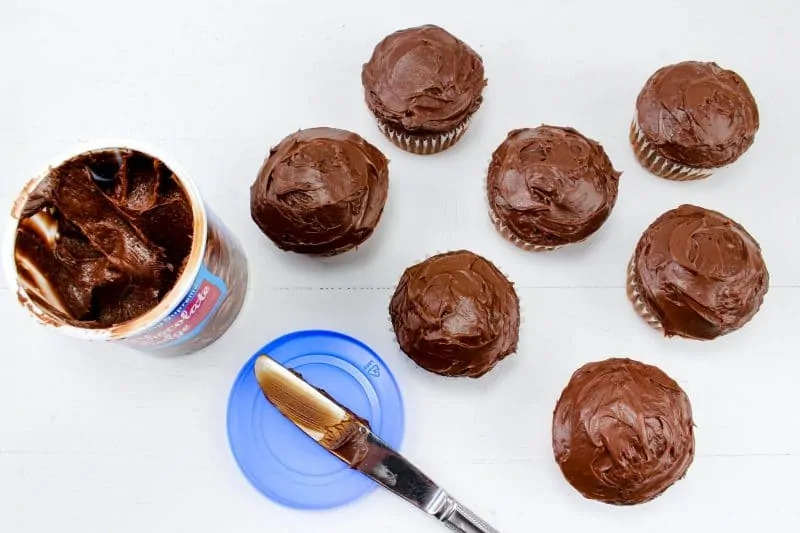 I never would have thought to use melts like that, what a fun idea for cupcakes.